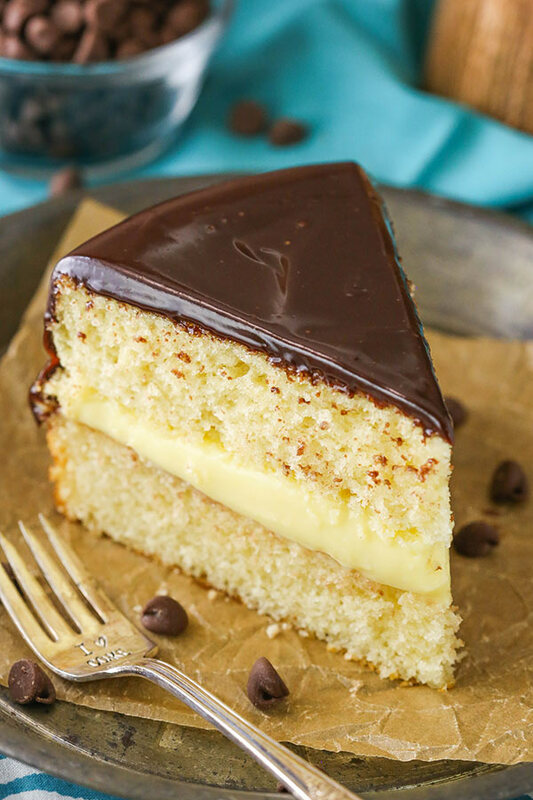 This Boston Cream Pie is a classic cake – not a pie at all! 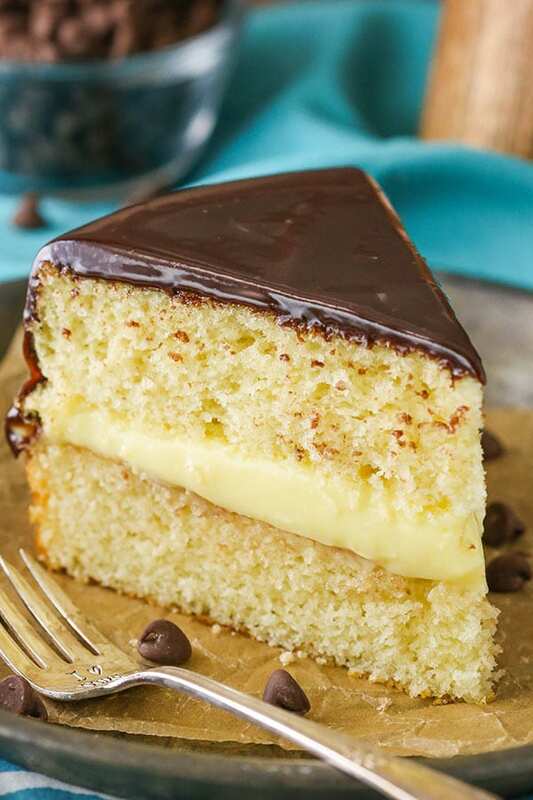 It’s a lovely vanilla cake layered with fresh pastry cream and chocolate ganache – all from scratch! This post is sponsored by Challenge Dairy, but all opinions are my own. 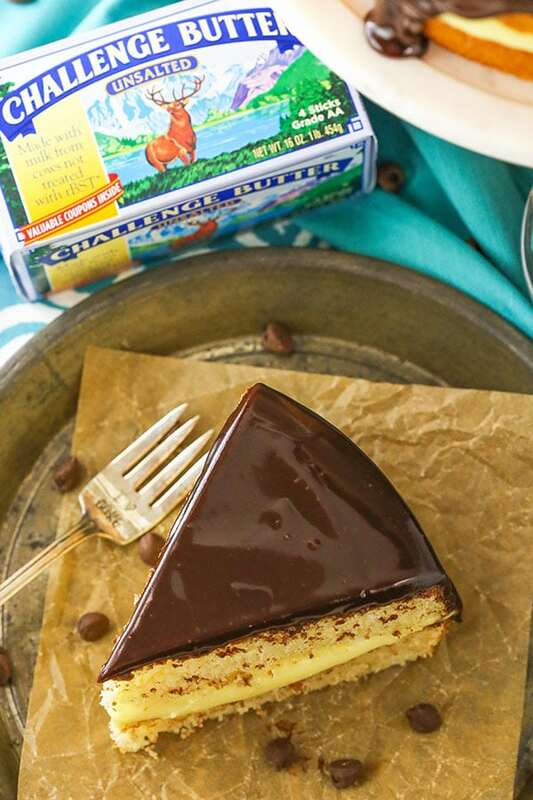 Boston Cream Pie has been around a long time. It originates in – you guessed it – Boston! And as the theory goes, it’s called a pie because at the time pie plates were more commonly used for cakes so it was actually baked in a pie plate and then layered like a cake. A pie that’s a cake! 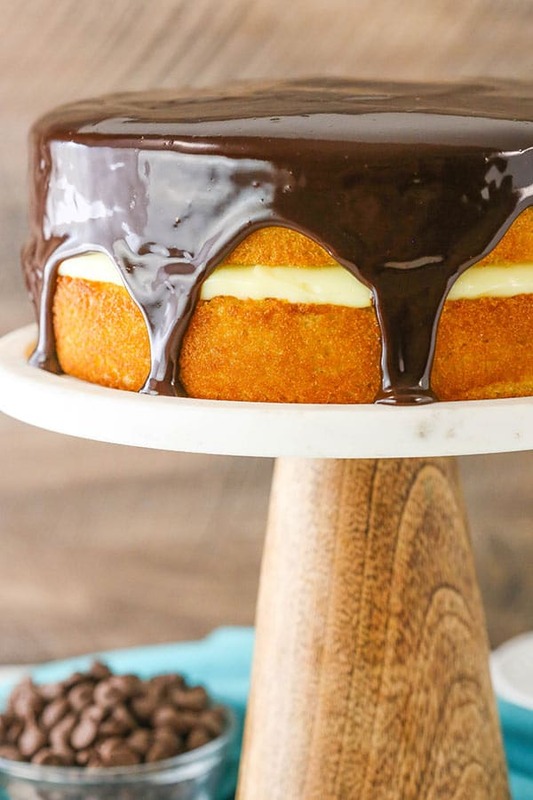 And you might know that I’m a pretty big fan of the vanilla cake, pastry cream and chocolate ganache combination. 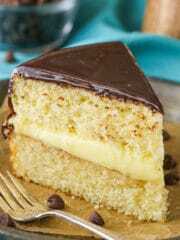 I have several Boston Cream Pie inspired desserts, but so far didn’t have the actual classic cake! So today I am fixing that with my own rendition of the classic. 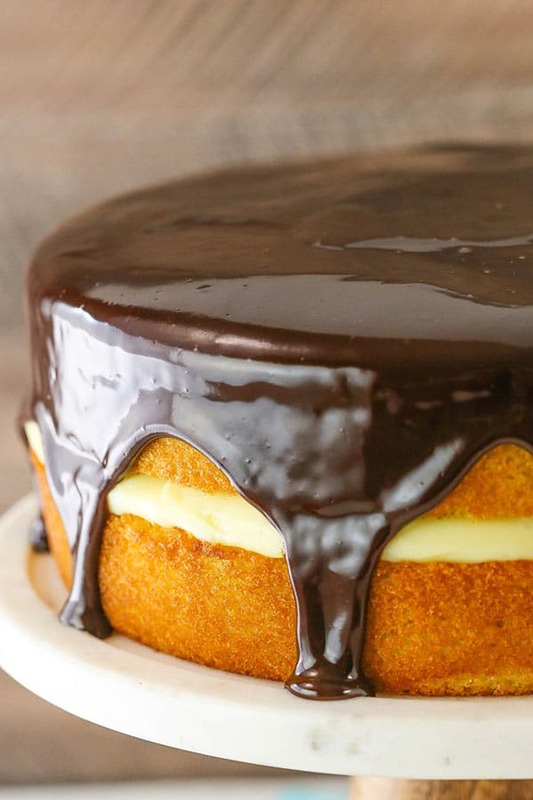 How do you make a Boston Cream Pie? To get started with this cake, you’ll want to make the pastry cream. It’s a combination of egg yolks, sugar and milk that are thickened with cornstarch and cooked over the stove. At the end, you add a bit of butter and vanilla extract for flavor. It’s really not hard to make, but you do want to be sure it’s nice and thick. 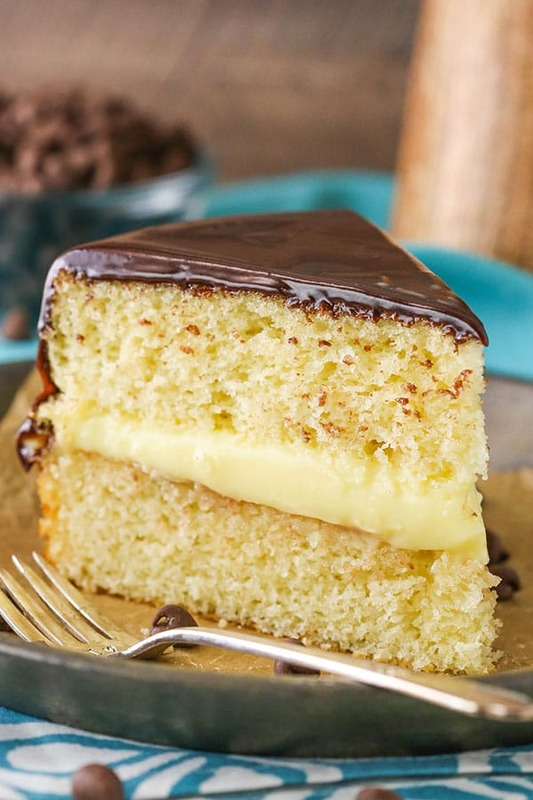 Fun fact – the first time I ever made pastry cream was years ago (back before I started the blog) when a friend requested a Boston Cream Pie and I decided to attempt it. Let’s just say there was more filling that ended up on the cake plate than between the cake layers – ha! I still don’t really know what I did wrong, but you’d think I left out the cornstarch completely since it was so thin. I was afraid to make it again at the time, but now I’m a huge fan and love the stuff! So if you find it scary at first, just know you can totally master it! Once the pastry cream is made, refrigerate it until cooled and thick. It can be made a couple days ahead, if needed. Up next are the cake layers. Traditionally a sponge cake is used, but I opted for a more classic butter-based vanilla cake. It’s wonderfully moist and goes great with the pastry cream. And, of course I used my favorite Challenge Butter. Their butter is made the old-fashioned way, from fresh milk and cream at family-owned dairies. It goes from farm to fridge in just two days and contains no added hormones, artificial flavors or fillers – which I love! It’s such a creamy butter with great flavor that goes perfectly in this cake. Once the cakes and pastry cream are made, they are layered together and covered with a simple chocolate ganache. Just a combination of semi-sweet chocolate, cream and a little corn syrup. The corn syrup could potentially be left out or replaced with honey, but I do like to use it. It helps give the ganache a nice shine and give this cake it’s snazzy look. The final cake is a delightful combination of moist cake, smooth pastry cream and dreamy chocolate! 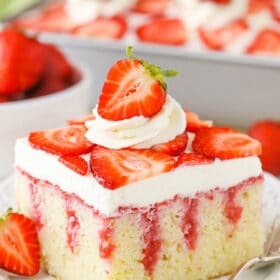 Such a classic cake that you’ll come back to over and over! 1. To make the pastry cream, put the egg yolks in a medium sized bowl and gently beat them together. Set aside. 2. Add the sugar, cornstarch and milk to a large saucepan and mix until smooth. 3. Cook, stirring continuously, over medium heat until mixture begins to thicken and bubble. 4. Simmer for 2 minutes, then remove from heat. 5. Add a little bit of milk mixture to the egg yolks and whisk together, then add egg mixture to milk mixture. This process ensures that you don’t cook the egg yolks too quickly. 6. Place everything back in the pan and the pan back on the heat and bring to a light boil. Allow to boil for 2 minutes, stirring continuously. 7. Remove from heat and add the butter and vanilla extract. Stir until smooth, then pour into a bowl and cover with clear wrap pressed against the top so that it doesn’t get a film on top and set in the fridge to cool completely. 8. To make the cake layers, prepare two 9 inch cake pans with parchment paper circles in the bottom and grease the sides. Preheat oven to 350°F (176°C). 9. Combine the flour, baking powder and salt in a medium sized bowl and set aside. 10. Add the butter, sugar and oil to and large mixer bowl and beat together until light in color and fluffy, about 3-4 minutes. Do not skimp on the creaming time. 11. Add the eggs and vanilla extract and mix until completely combined and smooth. Scrape down the sides of the bowl as needed to be sure all ingredients are well incorporated. 12. Add half of the dry ingredients to the batter and mix until mostly combined. 13. Add the milk and mix until well combined. The batter will look a little curdled, but that’s ok.
14. Add the remaining dry ingredients and mix until well combined and smooth. Scrape down the sides of the bowl as needed to be sure all ingredients are well incorporated. Do not over mix the batter. 15. Divide the batter evenly between the cakes pans and bake for 22-25 minutes, or until a toothpick comes out with a few crumbs. 16. 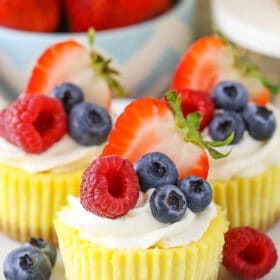 Remove the cakes from the oven and allow to cool for about 2-3 minutes, then remove to cooling racks to cool completely. 17. To put the cake together, use a large serrated knife to remove any domes from the tops of the cakes so they are flat. 19. Add the second cake layer to the top of the cake. 20. To make the chocolate ganache, add the chocolate chips and corn syrup to a medium bowl. 21. Heat the heavy whipping cream just until it begins to boil, then pour over the chocolate chips and corn syrup. Allow to sit for 1-2 minutes, then whisk until smooth. 22. Pour the chocolate on top of the cake, in the center, then spread out towards the edges, letting some of the chocolate drip down the sides. 23. Refrigerate cake until ready to serve. Cake is best if eaten within 2-3 days and well covered. 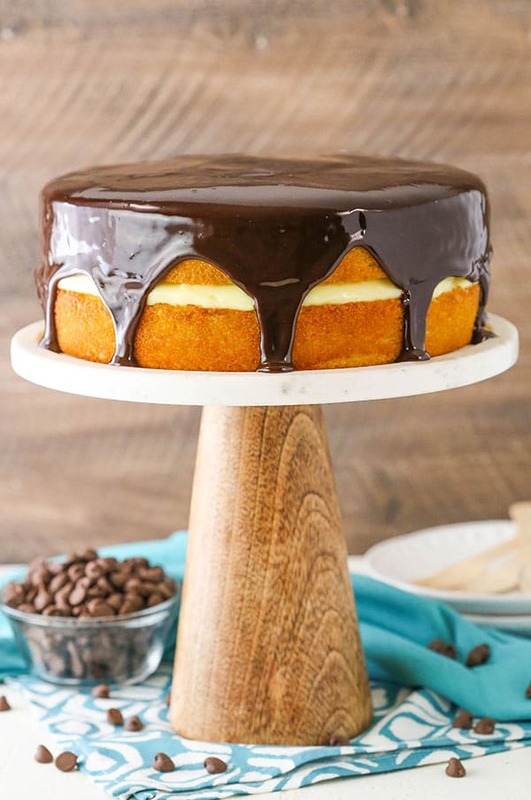 Although the pastry cream can be made a couple days ahead and the cake layers can be made a day ahead, I recommend putting the cake together within a couple hours of serving so the chocolate is fresh. this soon. Thanks, Lindsay! Enjoy the day! Thanks Suzy-q! I hope you enjoy it! This looks lovely. Would it freeze? Hmm, I’m not sure how well the pastry cream would do, but you could try it. HELP! This is my favorite pie. I attempted the pastry cream. Key word attempted. Mine too would up more on the plate than the cake for first time. I don’t know what to do. I want to make the pastry cream again but afraid I will go wrong again. How can I be sure it is thick enough to not run? The directions were so simple and I loved the video too. I saw your email first and responded to that. Hopefully it helped! I literally just made this today and my pastry cream too was runny, and i followed the recipe to a T. I had it chilling in the refrigerator for half the day. This was my first time making a boston cream pie and it came out beautifully! My family loved and my mother talks about it non-stop at her work, haha. I have been waiting to make this cake for some time, and now I can accomplish it! Thank you so much for this recipe! P.S. what is the best way of storing this cake? I placed it in the fridge and some of it got dried due to slices being cut. Any advice? I’m so glad to hear that! My suggestion would be to use a cake carrier, which seals air tight. It might not be perfect, but it should do well. If you don’t want to invest in a cake carrier, you could try putting some clear wrap up against the inside of the cake where you’ve sliced it. Lindsay, I made this cake yesterday. The pastry cream was too thin even though it sat in the frig for a couple of hours. Can the use of low fat milk contribute to the thinness of the filling? It’s possible. The amount of fat can certainly make a difference. It could also be that it wasn’t cooked quite long enough. It’s hard to say from a distance. I’m sorry! Do you have suggestions for preventing the cake from forming a dome? I tried both lowering the temperature by 25F and using a cake pin to more evenly disperse the heat. Does using a light versus darker colored pan make a difference? Can’t wait to try this recipe. It looks very delicious but I think I am going to use your chocolate ganache recipe to pipe onto the cake like you did for your cupcakes. Thanks! I would suggest trying bake even strips. No need for strips or cutting. Get a cake board smaller than the pan the cakes in . Right when you take cake out of oven and theirs a dome just place smaller board on cake and gently press down for a minute or so. Won’t work if cake has cooled, needs to be hot. You could leave it out or substitute with honey. You can also use a little vegetable shortening for your ganache. It works very well.. I have not made this cake as of yet, however I will be making it soon. I’m so glad you enjoyed the cake! Awesome! I hope you all enjoyed it! Merry Christmas! The filling was the perfect consistency (and honestly I had to prevent myself from eating it all before putting it on the cake-it’s so good! ), but my cake was a little dense. Is it supposed to be moist and light? Either way, it was delicious and quickly eaten on Christmas. Thanks for the recipe! I would say it should be more on the moist and light side, but I think everyone’s definition of light is a little different. 🙂 That said, I always recommend to be sure to fully cream the butter and sugar. Also, not to over mix the batter at the end. You could make the pastry cream a couple days ahead and the cake layers can be made a day ahead. I recommend putting the cake together within a couple of hours of serving so the chocolate is fresh. My suggestion for traveling would be to use a cake carrier, which seals air tight. Please clarify if pastry cream calls for 2 cups of milk or 240ml as 2 cups equals close to 500ml. It should be 480ml of milk. Thanks for bringing it to my attention, I have updated the recipe. I hope you enjoy! I just finished making this, and with a few adjustments, it came out perfectly. Following the directions for the custard, especially the cook times, it came out perfectly thick and delicious. For the cake, I sifted the flour mix, whipped the sugar/butter/oil for 4 minutes, combined the milk/eggs/vanilla and then alternated putting them into the whipped butter. The cake came out super moist. When I assembled the cake, I cut a well in the bottom layer because there is NO WAY the custard will support the top layer. It worked great! The ganache was perfect! Great recipe!! So I used this recipe for the custard and the chocolate ganache and it turned out perfect! Thank you! I made this for my brother’s birthday and every element was AMAZING individually but for some reason after I assembled them the cake -which was previously so fluffy and light- became quite dense. I was so disappointed because the cake was my fav vanilla cake I’ve ever baked. I’m trying it again tonight to see if it keeps it’s fluff better with a buttercream icing instead. Was that after refrigerating it? I do find that refrigerating cakes can make a difference, so I don’t love doing it, but it’s unavoidable with the filling of this cake. I made this cake today. It took two attempts at making the pastry cream. The first attempt, I followed the recipe exactly and ended up with a runny cream. The problem with the recipe is the cornstarch loses its thickening properties if 1. It’s over stirred and 2. If it’s heated for too long. Simple solution to the recipe on my second attempt : mix the cornstarch in with the egg yolks and add into the warm milk. Perfect pastry cream second time around! If you allow all of your cake ingredients to come to room temperature your cake will come out much better. I was a pastry chef for many years. Butter based cakes require this step for perfection. I haven’t ever tried it, so I’m not sure. Sorry!